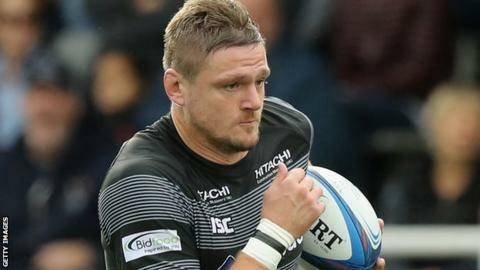 Newcastle lock Calum Green's disciplinary hearing over allegations he bit Sale's Rob Webber has been adjourned for more medical evidence. The 28-year-old remains suspended and could get a ban of at least 12 weeks if found guilty of the offence during Saturday's Premiership match. The panel will reconvene at 18:00 BST on Tuesday, 2 April in Leeds. Referee Craig Maxwell-Keys ruled at the time there was no clear evidence for action over the 22nd-minute incident. But citing commissioner Andy Blyth cited the forward after reviewing video evidence, while Sale boss Steve Diamond stated in his post-match interview that Webber needed treatment for a bite to his arm at half-time and after the game. According to Rugby Football Union guidelines, if a player is found guilty of biting the starting point for a suspension is 12 weeks for a low-end offence. Bottom club Newcastle won 22-17 at St James' Park and are three points behind 11th-placed Worcester in the Premiership table.